Texas Sen. Ted Cruz ended his campaign for the Republican nomination Tuesday night, CBS News' Major Garrett has confirmed, effectively ensuring Donald Trump will become the GOP's standard-bearer in 2016. "From the beginning, I've said that I would continue on as long as there was a viable path to victory," Cruz said. "Tonight, I'm sorry to say, it appears that path has been foreclosed. Together, we left it all on the field in Indiana. We gave it everything we've got. But the voters chose another path. And so with a heavy heart, but with boundless optimism for the long-term future of our nation, we are suspending our campaign. The Senator's parents took the stage before Cruz spoke with his elderly mother appearing bleary eyed as she stood in the back. The female campaign staffers were dressed in solemn black. An emotional looking advisor quipped "allergies!" when a few of the television embeds glanced over. Earlier, when television monitors at the event blared a pro-Trump super PAC commercial, the crowd burst out in chants of "Never Trump!" Cruz conceded the race at an event in Indianapolis following the results of Tuesday's Indiana primary, which Trump won handily. CBS News called the race for Trump right at 7 p.m., when the polls closed; with 72 percent of precincts reporting in Indiana, Trump led Cruz by 16 points, 53 percent to 37 percent. The Texas senator put everything he had into Indiana, saying repeatedly that it was the state that would determine the Republican race. 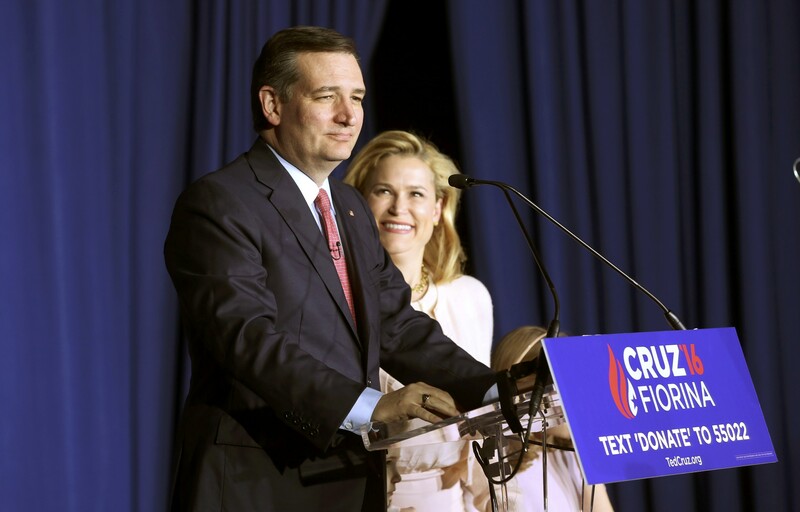 In an unprecedented move, Cruz and Ohio Gov. John Kasich announced in late April that they were teaming up and dividing up states in order to keep Trump from getting to 1,237. Kasich gave Cruz a clear path in Indiana, while Cruz vowed to do the same for Kasich in Oregon and New Mexico. Then, seeking to turn attention away from his poor showing in the April 26 Northeastern primaries, he on Wednesday announced Carly Fiorina as his vice presidential running mate at an event in Indiana. And Indiana Gov. Mike Pence endorsed Cruz, going all in with campaign stops, an ad cameo and an op-ed on Cruz's behalf. On the day of the primary, Cruz threw everything he had at Trump, saying he was finally ready to tell "what I really think of Donald Trump." "This man is a pathological liar," he said. He doesn't know the difference between truth and lies. He lies practically every word that comes out of his mouth." He then added: "The man is utterly amoral. Morality does not exist for him." Those comments capped a months long shift from the candidate who made the political calculation at the onset of the race not to go after Trump, tweeting at one point that the GOP front-runner was "terrific." The two enjoyed a non-aggression pact of sorts for much of the primary, with Trump concentrating his fire on other candidates and Cruz rising in the polls as the field dwindled. Cruz had hoped to become the conservative alternative to Trump, the more traditional candidate who could unite Republicans who found the billionaire unpalatable. Once the last men standing were just him and Trump, Cruz's thinking went, the party's base would rally to him. Ultimately, Cruz got the two-man race against Trump he'd been wanting all along--and he still lost. With Trump winning the majority of delegates out of Indiana, he is on the path to reach 1,237 delegates by the end of voting in June. Trump, too, took the high road when discussing Cruz in his post-election party at Trump Tower in New York. Rather than referring to him as "Lyin' Ted," which has been a frequent refrain from Trump in recent weeks, Trump called Cruz a "tough, smart guy" who has an "amazing future" in GOP politics. "Just so you understand, Ted Cruz, I don't know if he likes me or doesn't like me, but he is one hell of a competitor," Trump said. "He is a tough, smart guy--and he has got an amazing future. He's got an amazing future, so I want to congratulate Ted. "I know how tough it is, it's tough," he continued. "I've had some moments where it was not looking so good and it's not a great feeling and so I understand how Ted feels and Heidi and their whole beautiful family." Left unanswered is the question of whether the Texas Senator will support Donald Trump after exiting the race. He was heading home to Houston Tuesday evening, according to the campaign. Cruz has suggested recently that he does not make it a habit to support people who go after his family, which Trump has done numerous times -- most recently by insinuating that Cruz's father was involved with the Kennedy assassination. With his wife by his side, Cruz just smiled and waved as the pair stepped into a black SUV waiting for them as reporters shouted that question. CBS News Alan He contributed reporting to this story.